We are getting to the end of the State Tour! Only 10 states to go so we’ll have to do a countdown like on New Year’s Eve. State #10 is Iowa…and Iowa’s iconic food? Loose meat sandwiches. Visions of the original Roseanne series come to mind when I hear “loose meat sandwiches”. Remember Roseanne and Jackie opened a loose meat sandwich shop, The Lanford Lunchbox toward the end of the show? I think it was after they won the lottery…which turned out to all be a dream, right? I was never sure what loose meat sandwiches were, but I do know that the idea never sounded like something I wanted to try. 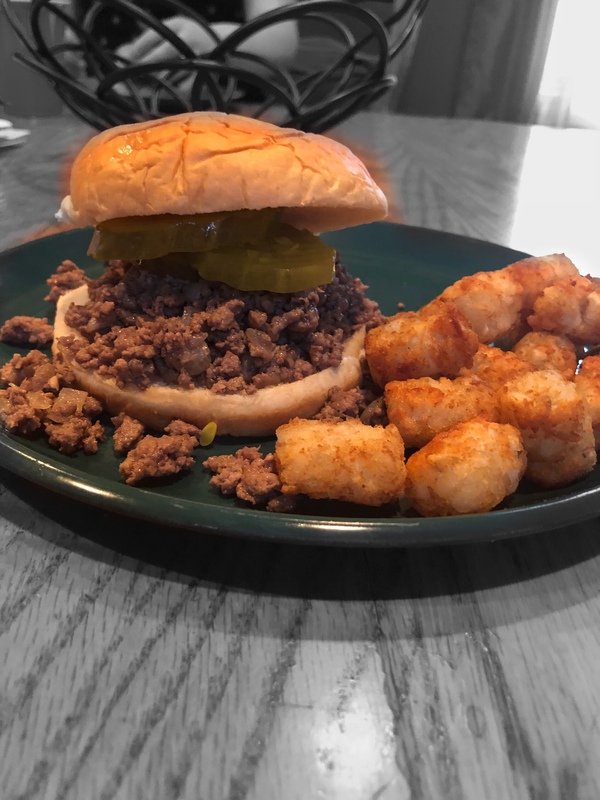 These sandwiches actually originated in Iowa, created by the Maid Rite corporation in 1926 (hence why they are sometimes called Maid Rite sandwiches…which honestly, sounds more appealing than “loose meat”.) There’s not much going on in Iowa from what I could gather online (Did you know kids can get their driver’s permit at 14?!?! Is there nothing else for them to do?!?!?! ), so I was thinking just because Iowans thought this sandwich was the bomb, didn’t necessarily mean a jaded East-coast food snob like me would like it. Still, I always tell the kids that they need to try new things because they never know if they’ll like them or not. This was the whole point of USA cooking experiment. So I guess I need to lead by example and try the loose meat sandwiches. (Insert nose wrinkle here.) First order of business was finding a recipe for loose meat sandwiches online. I searched high and low and oddly enough, the recipes for these sandwiches are nearly identical everywhere—I don’t like that. Remember the movie Office Space from the late 90s with Ron Livingston and Jennifer Aniston? All the great lines from that movie? Have you seen my Swingline? Or all the TPS reports that Peter had to do on the weekends? And when he came tromping through the office with Damn It Feels Good to Be a Gangster in the background? I could watch Office Space once a week and never get bored. If you haven’t seen this movie, I don’t think we can be friends. Anyway, one of the best scenes in the movie is when Jennifer Aniston’s boss is chastising her because she only has the bare minimum pieces of “flair” on her uniform. Jennifer Aniston’s character just wants to go through the motions at work and has no desire to be unique or stand out. I, however, would have more than the bare minimum of flair…I like to put my own stamp on the meals I make so that they’ve got some of my personality in them and they’re not just copycat recipes. Loose Meat sandwiches were no exception. 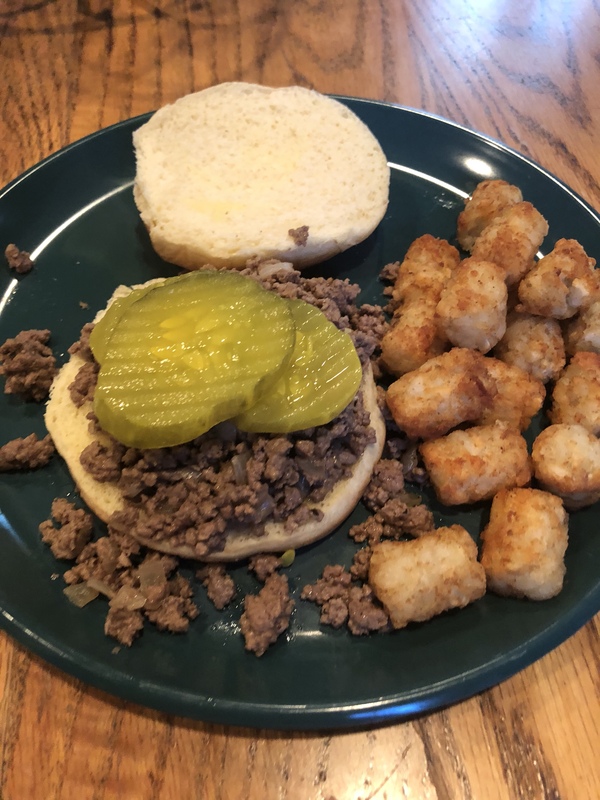 The ingredients were pretty basic as far as I was concerned: ground beef, onions, Worcestershire sauce, yellow mustard, sugar, garlic powder, beef broth, and of course, salt and pepper. Horseradish mustard. Okay, maybe it’s not ground breaking, but it gave the sandwiches a little more heat and flavor. And Hubby was proud of my efforts to enhance the meal’s flavor profile (we’ve been watching too much Master Chef I think…). If you don’t have horseradish mustard, use the yellow mustard and add some horseradish to it. Have I Ever Mentioned How Much I HATE Onions? It seems like every recipe lately has onions in it. My house perpetually smells like onion. Bleech. 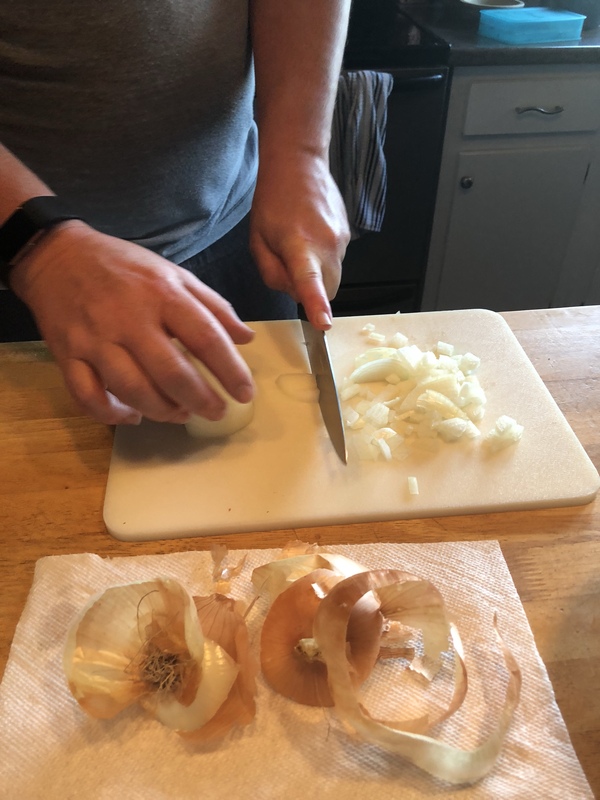 Since I hate touching the onions, I usually beg Hubby to chop them: He’s so much better at it than I am. And the chopping of the onions was seriously the most difficult part of this whole meal. The loose meat sandwiches were a breeze to cook—start off sauteing the onions in a saucepan. Add the beef and other ingredients one at a time. Finally, add the beef broth and simmer until the liquid is gone. My only “beef” with this recipe is that it called for WAYYYY too much beef broth. I would still be waiting for that liquid to evaporate if I had added as much as I had been instructed to. As it was, I only used about half the amount the recipe called for and after 40 minutes I ended up draining off the remaining liquid. I also discovered I could have made this in the crock pot. I’ll have to try that next time. Yes, maybe there will a next time. The sandwiches weren’t half bad…sort of like a deconstructed hamburger or something. Although if I make these again, cheese is necessary. I definitely have a difficult time eat hamburgers without cheese, but for the first attempt, I wanted to be a little authentic (minus the fact that I added my own ingredients to the meat).